6pc Bathroom Set Soap Dispenser Waste Bin Brush Holder Accessories Dark Pink. Toothbrush holder. Soap dish and lotion/soap dispenser. Toothbrush holder Toilet brush and holder. Toilet brush Toilet brush holder. Toothbrush holder. Soap dish and lotion/soap dispenser. Toilet brush and holder. 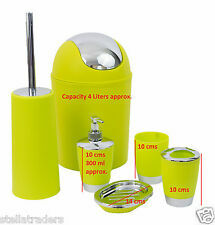 Toilet brush Toothbrush holder Lotion dispenser Soap dish Rinse cup and 4L waste bin. Sometimes, it is the little things that turn your bathroom from a boring place that doesn’t stand out into a room that makes it pop with personality and gets lips moving in sheer praise. When completing your bathroom renovation and redesign, you could be forgiven for electing to use the same old boring bathroom accessories, but who wants that? Instead, equipping your bathroom with products that are affordable, stylish and practical can give your bathroom the recognition it deserves. Tumbler, soap dish, lotion/soap dispenser. 3 Piece Bubble Print Bathroom Set. Padded serving lap trays. Crisp white in colour, the set features a distinctive black bubble print. Distinctive bubble print. Oval Soap Dispenser and toothbrush holder. Round soap dish holder and tumbler. You can Get Luxury Products at Affordable Prices. We've all the New Designs of Glass Mosaics in Town. Great deal while our supplies last! It's not often that you will come across a soap dish that is both beautiful and functional. The stylish and sleek design of the Sola Soap Dish is coated in shiny chrome and high-quality white ceramic, this is the sort of design that can fit in with any style of bathroom. Pair it with other bathroom accessories from our Sola range and you'll be achieving the bathroom of your dreams. 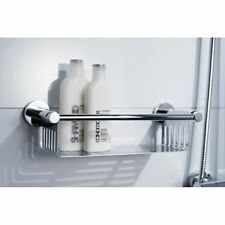 As well as being super stylish, it has superb functionality as it provides a lot of space to hold a bar of soap, preventing those annoying soap marks on the side of your basin or bath. Installing the soap dish is as easy making toast, including all the fittings needed so you can fit it your wall effortlessly and get on with the more important thing in life. Suitable for all style bathrooms, this attractive. The Grohe Essentials range is all about offering incredibly stylish bathroom accessories that will really make an impression in any bathroom design. The Grohe Essentials Soap Dish is no exception, with its unique look crafted from clear glass to pack a wallop of an impact despite its small size. Grohe knows that a soap dish can quickly become covered in soap scum, but thankfully the smooth surface is easy to wipe clean to keep that glassy gleam on a consistent basis. This beautiful contemporary soap dish is superb value for money. Every Grohe product comes with a hallmark of quality. Every single one of their cleverly designed products is built to last and to be constantly pleasing to the eye. Creating your ideal bathroom with the Grohe Essentials range couldn't . STAINLESS STEEL DIAMOND BATHROOM SOAP DISH QUALITY PRODUCT. STAINLESS STEEL DIAMOND BATHROOM SOAP DISH. 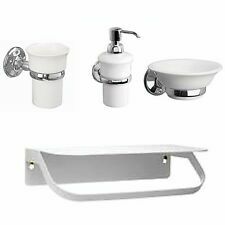 stylish collection of bathroom accessories . Toothbrush Holder. Toilet Brush & Holder. 1 X Toothbrush Holder: H12cm x Top Dia 8cm x Bottom Dia 5cm Approx. Lotion Dispenser. 1 X Tumbler: H10.5cm x Top Dia 8cm x Bottom Dia 5cm Approx. 1 X Lotion Dispenser: H17cm x Top Dia 8cm x Bottom Dia 5cm Approx.